Most companies and businesses now have policies in place to protect consumers from the unlawful access, use, or disclosure of personal information. Companies that violate their own policies can be cited by the Federal Trade Commission (FTC) for unlawful trade practices. The citation can lead to civil and criminal lawsuits and penalties. There are also many federal and West Virginia consumer protection and privacy laws that can be used against companies that violate your privacy. The lawyers at Paulson & Nace, PLLC, know the applicable laws and we work with the FTC when necessary. Our West Virginia family owned and managed team knows what remedies apply for violations of your data, including financial, medical, and personal information. Our West Virginia consumer privacy lawyers are ready to fight aggressively to stop illegal actions and sue wrongdoers for damages when laws allow. Notice and awareness. Website operators and all companies that collect data from consumers should notify the consumer or customer that they are collecting private information. Their plan should also detail how the company plans to use the information. Consent and choice. It is standard operating procedure nowadays that consumers be given the chance to opt-out of any business plan to use or disclose their data. The opt-out provision should be clear and easy to use. Consumers should also be given a choice as to how the data will be used. Direct access to the data. Consumers have to be able to see how the company is using their data. Consumers must also be given the chance to contest or correct any inaccurate information. Integrity and security. Every company that collects data should keep current with the latest technology needed to keep the data secure and safe from attack or fraud. The right of redress and enforcement. Consumers should have a remedy available. They should have a way to enforce violations of the company policy so errors and misuse of information stop. At Paulson & Nace, our lawyers know consumer protection and consumer privacy law. Our lawyers know federal laws and West Virginia laws as well. Our knowledge includes how to protect consumers from violations and what damages can be obtained to deter future misconduct. Each Paulson & Nace consumer protection lawyer has the know-how and experience to prepare lawsuits, advocate for clients, and try cases before juries or agencies. Our firm has the resources to stop unlawful trade conduct. We fight for our clients until the violations cease. If you think a vendor is violating your privacy, you need consumer privacy advice. Paulson & Nace represents consumers when companies do not follow their own rules, or when they violate West Virginia or federal consumer privacy laws. Please call 304-741-8079 or fill out our contact form to tell us your story in a no-obligation consultation. 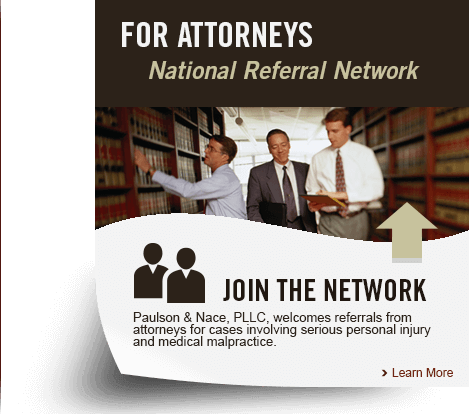 The Paulson & Nace, PLLC office is located at 3501 Maccorkle Ave SE, Charleston, WV 25304.